You’ve landed in Bali. The air is thick and warm. The airport is bustling and the smells are unfamiliar and slightly sweet. You grab your bags. This is happening. Here we go. Have you ever seen this much green? What kind of plant is that? Oooh; this place is *nice*. Where is that flute music coming from? Your room is spacious with huge windows and a perfect little patio overlooking the pool and the garden. Holy. Wow. That bathtub. We might need to stay here forever. How do they make the air smell like this? Yoga surrounded by green. The class is different than you expected. Everything is. It's been a very long day. That bed is going to feel wonderful. You wake up in your villa. The crisp white sheets on your skin. Birds you’ve never heard before. Plants and flowers and green juice are waiting for you. You grab your mat and head to class. Everyone has a gentle smile. This is not home. You are far away from familiar things. This might be both scary and exciting. This is how we learn. The movement and meditation made you feel grounded. At breakfast everything is delicious. Who knew fruit could look like this? Is there time for a nap? Yes? Perfect. And a massage? Wonderful. You could get used to this. Flowers peeking out of every corner. Sipping on a cool green juice. You take a little walk and then it’s time for class. Afterwards maybe you’ll go on an adventure. The temples. The markets. Your shoulders relax. Your jaw unhinges. This feels nice. You feel different. Lighter. Brighter. Is that a little sunburn? Maybe you should buy a bigger hat. And a sarong. Today we’re going to a waterfall. Will you be too tired for yoga? Maybe. Turns out balance comes naturally here. Slowly we move. Deeper we breathe. Meditation is something you'll bring home. Once you sit down for dinner you already know you’re going to sleep like a baby. Ginger. Turmeric. Curry. Goodnight. It's a full moon, so we head to the water temple. Tirta Empul. People have been coming here for thousands of years. For this water. From this spring. With this moon. You’re not sure what this will be like. It’s more than you expected. More emotional. More crowded. More Holy. Bali is another world. Another realm. Everything is new and old at the same time. You’ve decided to do the sunrise adventure. Is this crazy? Our guides pick us up at 2am. You doze a little in the car and then you begin hiking. You're handed a flashlight, but the moon is full. You hardly need it. The birds are waking up. You put one foot in front of the other. It's worth it. You watch the sun come up from the top of Mount Batur. All that ocean and all those colors. Your guides steam little eggs in the volcanic rocks. Someone hands you one and a cup of coffee. It's all downhill from here. At the base are Hot Springs. Once immersed in the warm water, you can’t believe your luck. This is exactly what you needed. Another massage please. And a nap. You have new muscles in your legs. You are doing a lot of yoga. Some of it is challenging. You walk more than normal and have to watch your step on the paths and roads. Your feet. Your core. Stronger than when you arrived. Alert but relaxed. Tonight you’ll have a traditional Balinese dinner, served in a local home. People here are so genuine and warm, you’ve never seen anything like it. You feel kinder. More open. Maybe Bali is contagious. NO. WHAT? Last day? What's happening? We just got here! You look over your tea at the faces you’ve gotten to know over the past week. The girl with the outrageous laugh. The man who can walk on his hands, but blushes with any eye contact. The couple who tell wild stories of wild places. You like these people. You like this place. You’ve made new friends. New human friends. New animal friends. New plant friends. Bali sort of feels like home. You anticipated this moment and rented a tiny spot down the road for the next week. You’ve explored with your group and feel comfortable. Your adventure continues. You hug everyone goodbye. There are some tears. You hug your teacher. The hosts smile and smile. You’re so glad you came. The retreat begins with yoga at 4pm on Saturday, March 16 and closes with yoga and breakfast the following Saturday, March 23. Ubud is artful and serene, a destination for those who practice yoga. Its two main streets are lined with cafes and shops, many selling goods from the region's artisans. Our 12 room resort - Honai sits on the edge of town, built in the style of a traditional Indonesian round house with the pool and gardens at its center. Stay on the grounds and enjoy the resort's restaurant, pool, and spa or take the complementary shuttle/bicycles into Ubud and explore. Denpasar International Airport (DPS). 30-day tourist visa purchased on arrival for $35 USD. There are no inoculations necessary for travel into Bali. Ubud is an hour west of the DPS airport. Honai Resort can arrange for a driver to pick you up at the airport for IDR 400,000 ($28) each way. Once everyone is registered, there will be an opportunity to coordinate ride shares for those landing/departing together. 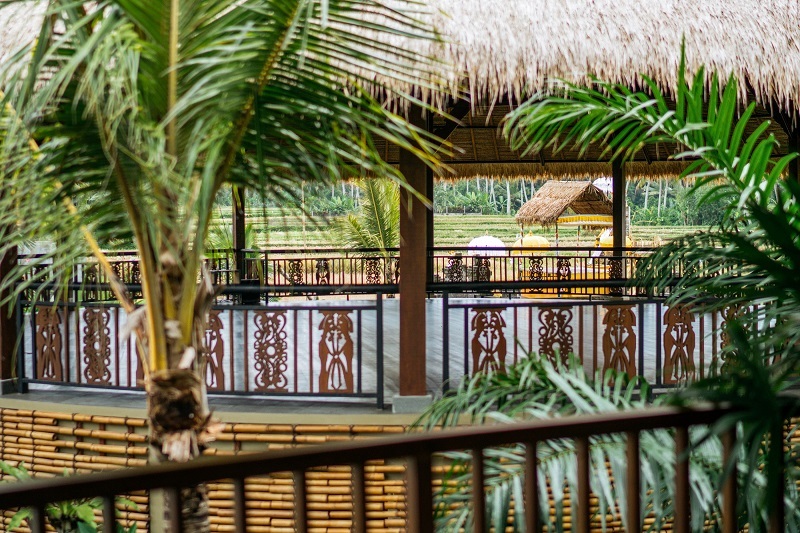 The resort offers a complimentary shuttle into Ubud and there are 4 bicycles for your use. An abundance of safe and affordable drivers also line the streets of Ubud. We'll have the entire resort for a week, 12 rooms total. Rooms face the swimming pool and garden. Check in 2pm | out 12.00pm. Early check in and late check out are subject to availability. Private or Double room. 55 square meters (600 square feet) with private bathroom, bedroom, balcony/terrace, A/C, separate shower and bath tub, tea and coffee maker, safe deposit box, mini bar, telephone, Wi-Fi and 24 hour room and daily turn down service. -yoga equipment: yoga mat, blocks, strap, blanket and bolster. Airport pick up arranged by Honai, IDR 400,000 ($28) per car per way. Honai's villas feature A/C, Wi-Fi, luxury linens, en suite bath (w/bathtub), private patio/balcony and lock boxes for your passport and valuables. Pricing Includes 7-nights accommodations, gratuities + taxes, all breakfasts + 4 gourmet dinners, excursions + activities. ** If you wish to book a double room, look at the picture of the close proximity of the beds below. I'll do my best to pair you with a roommate, if you already have one please indicate when registering. Your $400 deposit is non-refundable. The remainder of your payment will be refunded for cancellations through January 15, 2019. The remainder of your payment will be refunded after January 15, 2019 if a new participant registers. If Jennifer cancels this retreat for any reason, your entire payment will be refunded in full.